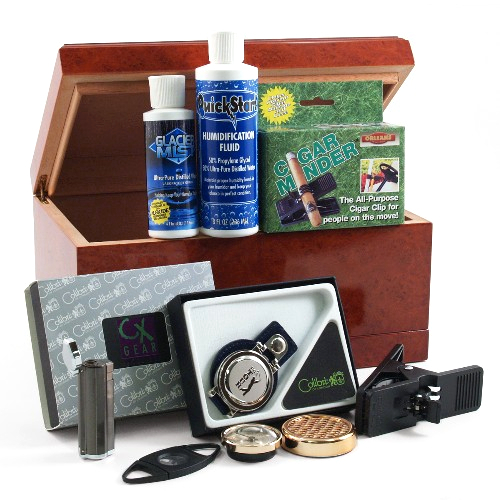 Our Exclusive Golfer's Cigar Humidor Gift Set includes everything a cigar smoking golfer could want! This collection features Eleven items essential to any cigar smoker! 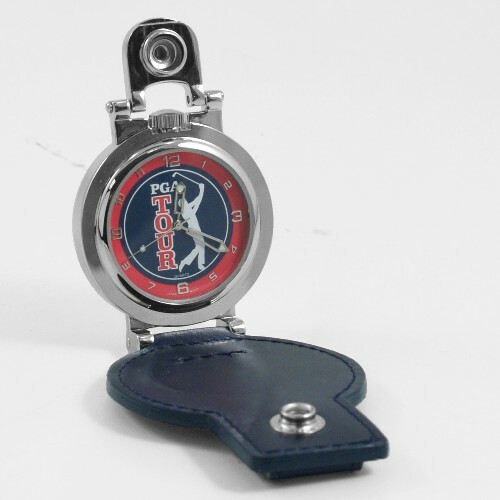 We start you out with the Licensed Colibri PGA golfers watch, add the now famous Cigar Minder cigar clip, then we take our top of the line burl wood cigar humidor and fill the humidor with a double blade guillotine cigar cutter, refillable cigar torch lighter with a punch cutter on the bottom, CigarExtras Quick Start humidification and CigarExtras Glacier Mist of course. What an incredible package, perfect to spoil yourself with this luxury or it does make an absolutely incredible gift. 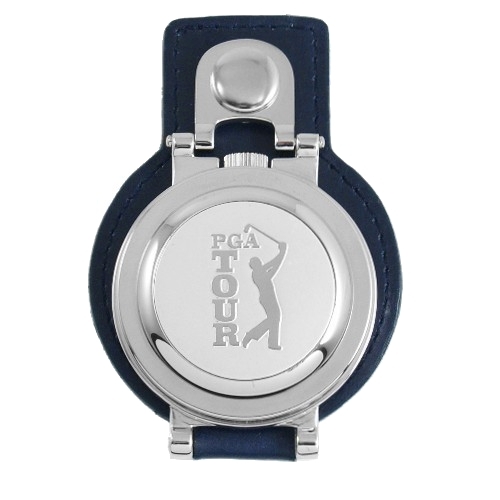 The retail value of all these luxuries is $125, heck the Colibri PGA watch is $60 by itself, but we have packaged this all together for an incredible value that will not last. Please note that our quantities are very limited and when we sell out there will be no more! This Collection is an exclusive of HumidorAuctions and CigarExtras we have not made this package available to any other retailers! The Salerno humidor is truly a handsome box that will hold 60+ cigars depending on size. Finished in a rich burl veneer and routered edges make it standout form other humidors. Now you will have a place to store your lighters, cutter, punches and more in the bottom drawer. The bottom drawer can be used for cigar storage if you choose. The cedar lined drawer would simply need a cigar shaped humidifier (sold separately ) to be used for cigar storage. The Salerno humidor was designed to impress but also designed to be as fully functional as it is incorporates loads of bells and whistles.